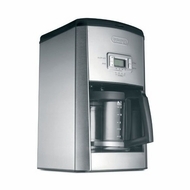 DeLonghi's Drip Coffee Maker with large 14–cup capacity is perfect for that morning jolt or entertaining dinner guests. The 24 hour programable timer lets you wake up to the aroma of fresh brewed coffee. The convenient and unique "Freshness Indicator" lets you know how long ago the coffee was brewed by 15 minute intervals. The shower head design helps to extract your coffee's full natural flavor by allowing water to completely saturate all coffee grounds. It even features an "Aroma Button" which uses a special process to slowly extract the best flavor from your coffee.